Sixty-eight years ago today, your grandparents’ generation had their 9-11 moment. On that day, the Empire of Japan decided to sucker-punch the United States Pacific Fleet, stationed at Pearl Harbor near Honolulu, Hawaii. The Japanese military leadership hoped that by destroying America’s naval presence in the Pacific, they could bully the United States into accepting Japanese hegemony in the Far East. This would allow their aggressive expansionism to continue unchecked. The attack began at 11:55AM Eastern time (6:55AM local time), with the aerial bombing beginning almost an hour later. 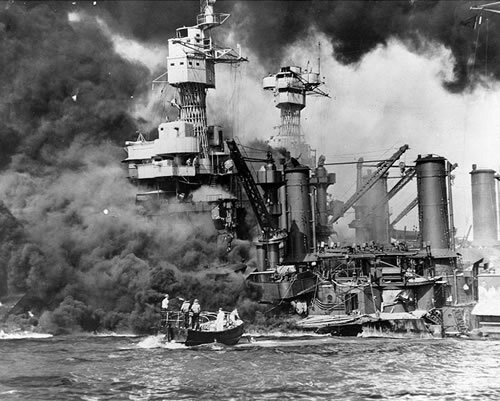 The Americans at Pearl Harbor were taken by surprise, and nearly 3,000 were killed. The destruction was nearly complete: 4 battleships sunk; 4 battleships damaged including 1 run aground; 2 destroyers sunk, 1 damaged; 1 other ship sunk, 3 damaged; 3 cruisers damaged; 188 aircraft destroyed, 155 aircraft damaged; 2,345 military and 57 civilians killed, 1,247 military and 35 civilians wounded. The United States, however, was fortunate on this day. The decisive weapon of the war in the Pacific would not be battleships, but aircraft carriers, and the American carriers were out to sea when the Japanese struck, and thus they survived. 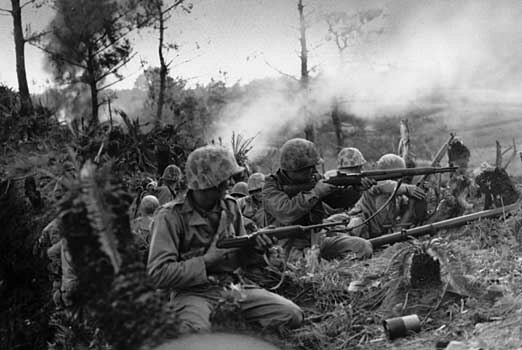 What the attack had accomplished more immediately, however, was to thrust the United States into the Second World War. For the next six months, the Japanese Empire ran amok in the Far East, capturing nations at will as the United States at first reeled, and then began to build the most formidable war machine in human history to that point. By the summer of 1942, the United States had begun the process of taking the fight to the Japanese, winning two stunning victories at Coral Sea and Midway. From then on, the Japanese were on the defensive. But on December 7, 1941, Americans didn’t know how things would turn out. Many expected a Japanese invasion of the West Coast; any American with an Oriental look about them was soon considered suspect. Many whites had no time for subtleties -to them, they all looked like the guys flying Zeros at Pearl Harbor and Midway. Not long after this, the internment order for Japanese-Americans would be issued. For my father, then a seventeen-year-old living at St. Mary’s Industrial School on the present site of Cardinal Gibbons School, the entry of the United States into the war brought him to enlist in the Marines. He would eventually be wounded on the Japanese island of Okinawa in 1945, but lived to tell the tale. He quickly recovered and would have been part of the invasion of the Japanese mainland had not the atomic bomb ended the war. For this, I probably owe my existence, because conservative estimates put American casualties in Japan at around one million. The day after Pearl Harbor, President Roosevelt said that the date would “live in infamy.” For many younger Americans, the date has already lost its meaning, and the future looks bleak as less than 50 survivors of the attack remain. Soon, there will be no one to recall the events of that day, and we will become dependent on books, photographs and films. But today, while we still have them here, let’s not pass up a chance to pause for a moment or two and recall their 9-11 moment, just as we hope that sixty years from now, our grandchildren will be able to recall ours. As long as we keep reminding others about days like Pearl Harbor they won’t fade away. Remember the thrill you felt when you uncovered new material on subjects that interest you? I was in fourth grade reading WWII narratives wondering why no one talked about this stuff in class. Then I found out my great uncle, Admiral James O. Richardson, was the Pacific commander who got fired for complaining about moving the Pacific fleet to Hawaii. Thanks for keeping the old guard in the light. It is important..
You have an interesting story to tell. You must have access to a wealth of fascinating sources and people because of your family’s history. Have you ever written about it? BTW, I’ve linked your blog on my blogroll. I’ve done a ton of research and wrote a screenplay that takes a ‘Forest Gump’ like journey through the War in the Pacific. My hero mans a radar station on Hawaii. He’s on the Hornet with Jimmy Doolittle. My feeling is that the end of WWII in Japan has never been told right, that the huge air bases in the Marianas have never been shown on the big screen. Imagine the busiest airport in the world, and the airplanes are all bombers.